What do you offer for short-term rehabilitation patients? How do you help me prepare to return home? What are the hours of your rehab center? Short-term rehab patients enjoy a separate residential wing with comfortable rooms, spa-like showers, and a private dining and computer room with Wi-Fi access. A kitchen, laundry room and bedroom are all set up for occupational therapy. Our unique, garden-like “texture path” helps rehabilitation patients increase their mobility on a variety of outdoor surfaces including grass, river rock, stepping stones and a small bridge. 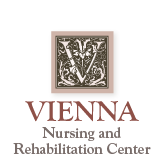 Vienna's rehabilitation center is open six days a week for inpatient therapy and five days a week for outpatient services.